Expressing the purity and intensity of varietal character, the Bonterra Vineyard of Mendocino County is a pioneer in organic wine growing. 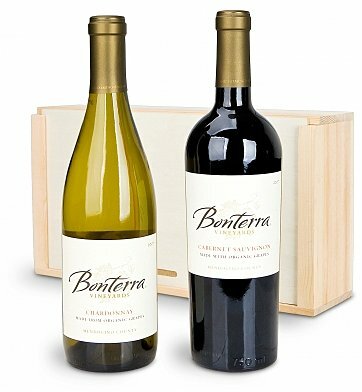 In this elegant gift, Bonterra presents their toasty chardonnay and bold, rich cabernet sauvignon. One bottle each of Bonterra Chardonnay, and Bonterra Cabernet Sauvignon. For more information on this wine, please see the Tasting Notes. These fine Mendocino County wines are presented in our enduring signature wine crate. A complimentary card is included with your gift. Measures 14" x 8" x 4"
The Organic Duo is a hand delivered gift. These gifts are delivered by one of our local design centers located throughout the United States and Canada. Same day delivery is available for most gifts when ordered before the cutoff time. The cutoff time for The Organic Duo is in the recipient's time zone. Bonterra Cabernet SauvignonAn Old World style wine with juicy red berry and spice flavors. Bonterra ChardonnayRich aromas of baked pear and toasted almond in a welcoming Chardonnay. An approachable, Old World styled wine with juicy red berry and spice flavors. The mouthfeel is rich and full, giving way to a thoughtful finish. An inviting introduction with rich aromas of baked pear and toasted almond. Flavors of pineapple and citrusy lemon are balanced by vanilla and butter cream. In this elegant gift, organic winery Bonterra Vineyards presents their toasty chardonnay and bold, rich cabernet sauvignon. Two Organic Wines from Bonterra Vineyards. Presented in GiftTree's signature wooden wine crate. Includes complimentary card with your personal message or greeting. I purchased this as a 25th Wedding Anniversary gift, mostly because of the option to add a silverplated hangtag. I was a little worried how well the engraving on the hangtag would be done, but I was VERY pleased when I received the gift. It is beautiful. The hangtag is enough of a memory for the couple to keep, and some good wine to celebrate with. Thanks for such a nice idea and great combination of wines.